This chart shows the positions of Pluto and New Horizons this week as seen at 1 a.m. EDT in a high power eyepiece. On July 14, a NASA spacecraft will make a close flyby of Pluto, sending back the first up-close images of the dwarf planet's surface. In anticipation of the New Horizons flyby, this sky chart can help you find Pluto in the night sky (with the assistance of a high-power telescope). 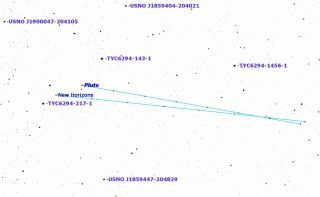 The chart shows the positions of Pluto and New Horizons as seen through a high-power telescope eyepiece with a field of view of 15 arc minutes. Both are moving from left to right. The leftmost dots (labeled "Pluto" and "New Horizons") show their positions at 1 a.m. EDT (0500 GMT) on Thursday (July 9), and the remaining dots show their positions at the same time through the morning of July 16. Notice that the paths cross between the positions for July 14 and July 15, the exact time that New Horizons flies by Pluto. Of course, New Horizons is too small and far away to be visible even in the largest telescopes, but it's interesting to see its position relative to Pluto. New Horizons is the first probe to study Pluto up close, and no telescopes currently in operation can resolve the dim, distant dwarf planet well enough to get a good look at its surface features and composition. New Horizons' most recent images of Pluto and its five moons are already beginning to reveal never-before-seen details of this strange system. After New Horizons passes by Pluto, it will travel deeper into the Kuiper Belt, a region of icy bodies beyond Neptune, where it may study study another object (if NASA approves a proposed mission extension). Only four other space probes have ever traveled into that distant region. This article was provided to Space.com by Simulation Curriculum, the leader in space science curriculum solutions and the makers of Starry Night and SkySafari. Follow Starry Night on Twitter @StarryNightEdu. Follow us @Spacedotcom, Facebook and Google+. Originally published on Space.com.